Choosing where to sell your car is an important decision. Let’s look at the pros and cons of your various options. When you're thinking about selling your car, there are two key factors to consider: how much money you want to sell it for, and how much time and effort you can put in. Depending on how important these factors are to you, there will be an option to best suit you. Selling your car by yourself is likely to be the way to get the most money – 10-15% more than selling to a dealer, according to the Money Advice Service. And, if you advertise here on Auto Trader, you’ll be putting your car in front of the UK’s largest car-buying audience. This may take you a bit of time, as you’ll need to create an ad and respond to all the enquiries. You’ll also need to make yourself and the car available for potential buyers to view; and, depending on where you place the advert, you may need to pay for it. Selling your car to a local dealer is normally a low-hassle method, especially if you’re part-exchanging your car as part of the deal. That said, you almost certainly won’t get as much money as you would selling your car privately. After all, the dealer has a business to run, and they may have some work to do to get the car retail-ready after they’ve bought it from you. BEST FOR Getting a decent price without too much effortThis option is worth considering if you don’t want to invest the time required by a private sale, as you won’t have to spend time dealing with enquiries or viewings. How much will I get for my car from a dealer? If you sell the vehicle to a used car dealer outright, you’ll get a price based on the car’s trade value and condition, so it won’t be the best price. Normally, your car’s part-exchange value will be slightly higher than the trade price you’d get from selling your car outright. That said, the dealer might not be willing to negotiate over a part-exchange price. Generally speaking, part-exchange (trading your car in when buying another one) is one of the easiest ways to sell your car. Selling a car to a dealer outright can also be a relatively simple process, if you are willing to take less money for the vehicle. How much should I get for my car? 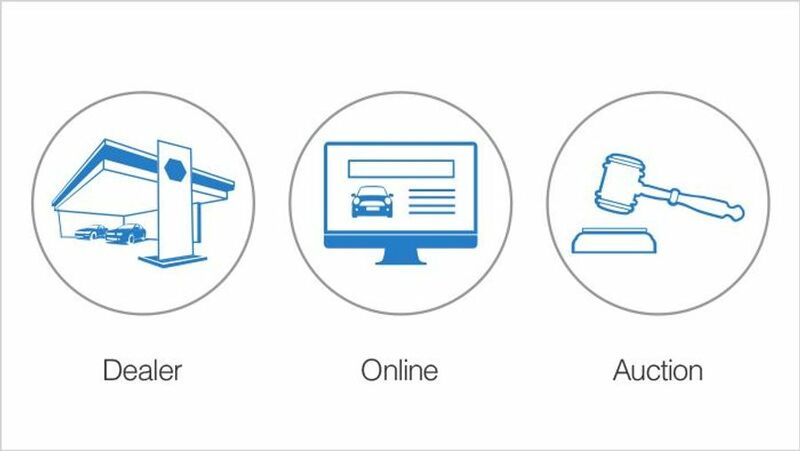 Use our free valuation tool to get an indication of how much your car is worth, but remember there’s no guarantee of a good price, so you may need to visit more than one place to get a decent deal. There’s plenty of glitz and glamour in the advertising for websites that guarantee to buy your car, but the reality may not be as attractive. Most importantly: these are businesses who want to make money from selling your car, so they're likely to offer less than its true market value. Any value you’re quoted online will be subject to an inspection at a local depot. If the inspection finds faults, they will drop their offer – sometimes by a significant amount. You may also have to pay an admin fee for this service, which will further reduce your take-home money. If you just want to get rid of your car and get hold of some quick cash with the minimum amount of hassle, this could be the best way. BEST FOR: Putting your car in front of multiple potential buyers at one time without having to discuss price with them. Auctions are not for the faint-hearted, which is why you rarely see private buyers in the room. Instead, these are generally the hunting ground for dealers. As they’ll want to make a good profit on whatever they buy, they’re likely to offer a low price. You’ll need to set a reserve price; but, given the potential buyers' desire to bag a bargain, there is no guarantee this will be achieved. If it isn’t, you could leave with the car still unsold and have to try again. If you do manage to successfully sell your vehicle, you can expect the auction house to take commission, as well as possibly charging an admin fee. There are live auctions across the country, as well as some online auctions too.